$100,000 for your cause and the chance to learn from today’s top thought leaders! Now in its 27th year, The Drucker Prize celebrates nonprofit innovation by recognizing America’s most innovative nonprofit with an unrestricted $100,000 cash award. Beyond the money, The Drucker Prize offers nonprofits a host of practical insights to help them become more innovative and effective. By applying, your organization will gain access to The Drucker Prize’s exclusive resource-rich learning platform which blends the timeless wisdom of, management pioneer, Peter Drucker with the thinking of some of today’s brightest management minds. Submit your round 1 application by Tuesday, April 30. 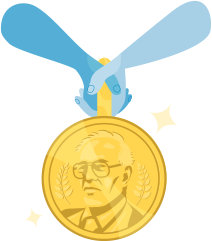 The Drucker Prize is proudly powered by Skild.